We provide different types of coatings which includes, Electroless Nickel Plating. Electroless Nickel Plating This process is commonly used in engineering coating applications where wear resistance, hardness and corrosion protection are required. Electroless means that the process used to plate the gold onto a surface is not the traditional electroplating cell having electrodes and an external power supply. Electroless gold is deposited from a solution purely as the result of the reaction of chemicals in the bath. Types of Electroless Plating: Low, Mid & High Phos. Types: Low, Mid & High Phos. Leveraging on our tremendous industry experience, we also provide our valued clients Electroless Plating Services at minimal time interval. We are a leading manufacturer of Immersion PCB TIN plating solution. Electroless plating is a process which uses an auto-catalytic chemical reaction to deposit a coating onto a wide range of substrates. 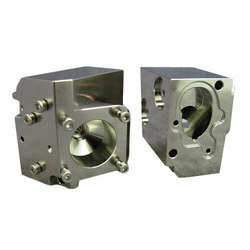 Components plated in electroless nickel possess an excellent combination of wear resistance, corrosion and chemical resistance. For your critical high engineered parts of mild steel or SS , which requires a high corrosion resistance, wear resistance , with hardness and cost effective, here is a solution of electroless nickel plating, we can serve you with the best quality and timely delivery in the industry. So as to acquire utmost level of customer acknowledgement and trust, we are engrossed in offering highly reliable Electroless Nickel Plating Service. Rendered by dedicated and assiduous personnel, these provided services are widely acclaimed and treasured. In addition to this, our customers can buy these services at highly affordable costs.